Please click on REQUEST A QUOTE on the left and complete all information to submit a Quote Request. We will contact you as soon as we receive the request. Our processor will cut and split your firewood all at once. A loader, skid steer or tractor with forks is needed to load the logs onto our processor (6′ off the ground) if you don’t have the necessary loading equipment we can supply it. We’re mobile and can go wherever a 3/4 ton truck can get to. We can cut the firewood pieces to your desired length (most folks go with 16” but we can go up to 23″ for outdoor boilers or other requirements) and split it into as small (or large) of pieces you need. 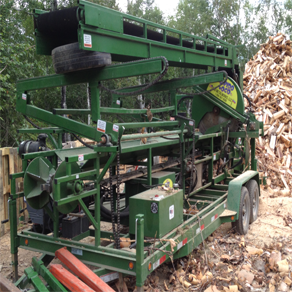 Our rates are dependent on quantity of firewood and travel time but start at $75 / hour for splitting and $175 / hour for processing (cutting and splitting). This includes an operator and all expenses (fuel, travel, etc.) Our average rate of processing is 2 cord per hour. Do you have the trees and / or logs that need to be cut and split into firewood but don’t have the time or energy or willing helpers to get the job done? Then let Firewood Manitoba come to your site and process that firewood for you. We’ll go where you need us and convert that pile of logs into burnable / stackable / enjoyable firewood. Our average rate is 2 cords per hour (and up to 4 cords an hour if you follow our tips below) you’ll have a winter’s worth (or more) of firewood ready to go without touching an axe or a saw. The processed wood will be in a pile when finished but if you like you can stack it onsite, haul it away etc. Or park your truck or trailer under our conveyor and save some work by having the firewood drop right into it.